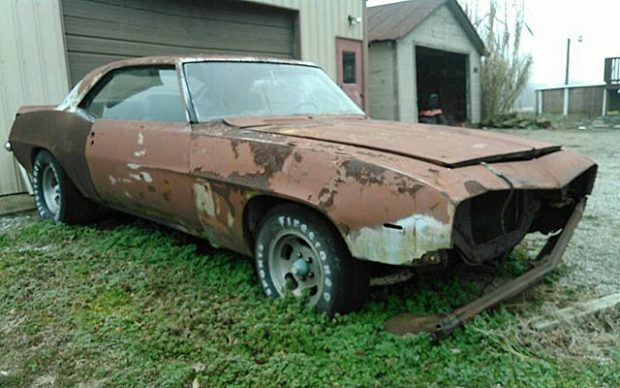 This is not a barn find or a garage find. It’s a worn out field find. This car was driven hard and beat up good. Over the years the owners slapped on tires, wheels, scoops, and lots of bondo. Yes, it had the famous 302 engine and reliable four speed transmission. Many non Camaro people will argue Chevrolet did not have a 302. They had a 307, a 350, a 396 and a 454 but never a 302. Of course the non Camaro people are wrong. Chevy did have a 302 in this Z/28 and it was powerful back in the day. For it’s part the Camaro’s were driven hard back then. That is what Chevy wanted you to do. Go out and find a Mustang or another competitive brand and blow there doors off. I had a good friend back in the mid seventies that had one of these cars. He drove his hard and he loved it. He had the famous blue with the white stripes. This car in this picture is in need of a frame off restoration now. You won’t lose money if the numbers match and it’s done correctly. I saw that first hand. So, should you go out and look for these cars? Yes! They were fantastic cars then and remain so. Just think, what else from 1969 remains so hot? What else in our lives that was built or made in 1969 holds this type of value? Who would have thought a car would not only hold its value but increase it every year? Even cars like this one that are missing parts like the front section hold its value. These cars were fun then and are fun now. That’s rare. Parts exist for this car at reasonable prices. When you complete your restoration you will be noticed. You won’t lose money and you won’t get bored. Find these and you will find the pot at the end of the rainbow. I have known this for years and my recent attendance at Barrett Jackson confirmed what I thought. So, please find these cars and restore them. You will never go wrong. Remember, some cars are red hot right now. It’s better than your lousy 401k and much more fun.